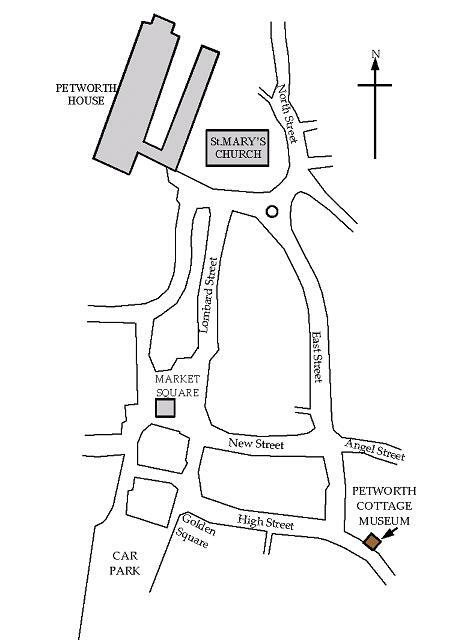 Welcome to www.petworthcottagemuseum.co.uk, the website of the Petworth Cottage Museum, at 346 High Street, Petworth, West Sussex, GU28 0AU, in the South Downs National Park. The museum is a Leconfield Estate worker's cottage restored and furnished as it might have been in about 1910, when Mrs. Mary Cummings lived in 346. The museum also has a rare collection of Petworth Goss China. For full contact details click here. For how to find the museum click here. For a downloadable leaflet click here. For details of special events click here. For opening times click here. There is a cottage garden, a scullery, living room, bedroom, sewing room, attic and cellar. The museum is staffed by volunteer stewards who offer our visitors a friendly welcome, and is run by The Petworth Cottage Trust, an independent charitable trust. If you would like to volunteer as a steward, use the contact page to call or email us. Friends of the Museum receive a free pass in return for a regular donation. For a Friends Leaflet/Application Form click here. For some links to related sites click here. The museum website is designed and maintained by Gordon Stevenson.